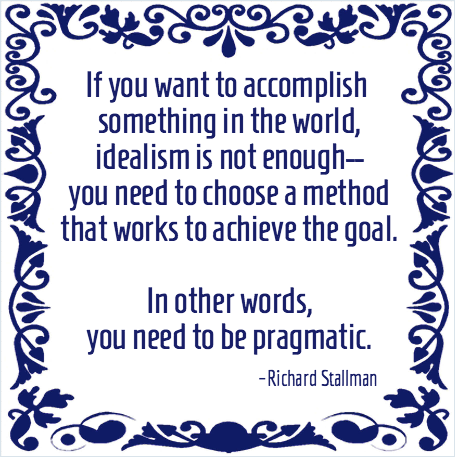 Quote of the Day: Richard Stallman on Pragmatism — Did I Say That? Posted August 21, 2015 & filed under Quote of the Day. A tegeltjeswijsheid is an adage/aphorism/truism/what-d’ya-call-’ems printed on a ceramic tile. As I need to pull out this quote from the great open source philospher Richard Stallman over and over again, I might as well make a linkable version.